A new investigation from the Center for Media and Democracy has revealed that the American Legislative Exchange Council (ALEC), in conjunction with the National Rifle Association (NRA), is working to spread a Florida law that may protect the man who shot and killed 17-year-old Trayvon Martin in Florida this February. Lawyers for 28-year-old George Zimmerman, who shot Martin the night of Feb. 26, have indicated that Florida’s “stand your ground” law, which grants legal immunity to persons using lethal force in self defense, will be an applicable defense if charges are brought against Zimmerman. Authorities failed to arrest Zimmerman the night of the now-infamous shooting after he claimed he was acting in self-defense. Police took Zimmerman at his word, and he has yet to be charged in the case. As a result, the stand your ground law has met intense ire as Martin’s case has gained national attention. But the National Rifle Association has not reversed its support for the measure, and five states will still be debating similar legislation this term. The Center for Media and Democracy has uncovered an unholy alliance between conservative politicians, the NRA and ALEC that has been used to push for the measure's adoption by state legislatures across the nation. Known also as the “castle doctrine,” from the old saying “a man’s home is his castle,” the stand your ground law gives legal immunity to a person who uses “deadly force if he or she reasonably believes it necessary to do so to prevent death or great bodily harm to himself or herself or another or to prevent the commission of a forcible felony.” The Florida law essentially codified existing practice, but notably repealed a requirement to retreat from danger before resorting to deadly force, which critics say encourages gun holders to fight rather than flee in times of peril. After the bill’s easy passage in Florida, the NRA announced a plan to advance similar legislation elsewhere. In an interview following the bill’s passage, Wayne LaPierre, CEO and Executive Vice President of the NRA, said the law was the “first step of a multistate strategy” to capitalize on a political climate dominated by conservative opponents of gun control at the state and national levels. 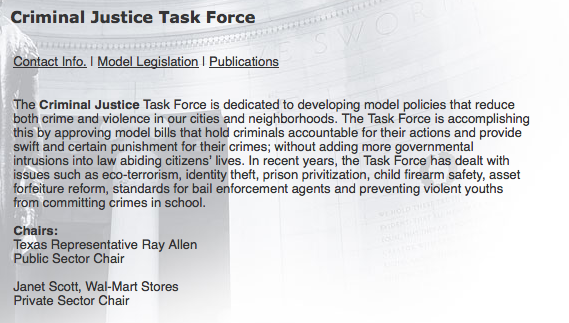 Hammer later presented the legislation--taken word-for-word from Florida--to ALEC’s Criminal Justice Task Force (now known as the Public Safety and Elections Task Force). The Task Force unanimously approved the bill as a prototype for ALEC to advance throughout the country. Since the law became an ALEC model, the Center for Media and Democracy reports, 16 states have passed laws that contain provisions identical or similar to the ALEC "Castle Doctrine Act." 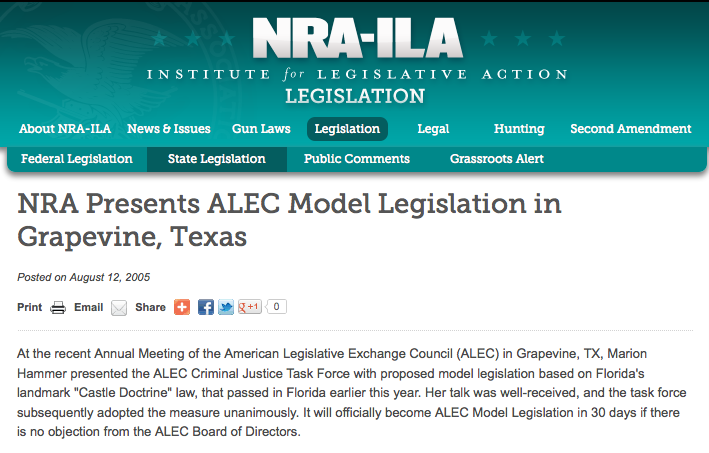 In 2007, the legislation passed in four states and highlighted by ALEC on their "legislative scorecard." The problem, as the Center for Media and Democracy suggests in its analysis, is two-fold: one, a vague organization under wide corporate influence is hatching model bills approved by legislatures across the country, and two, the legislation has potentially devastating implications for communities of color. The CMD notes that ALEC Task Force Meetings are closed to the press and public, but corporations and ideological special interests or trade groups like the NRA vote as equals with elected officials. Indeed, the Criminal Justice Task Force had both Public Sector and Private Sector Co-Chairs. At the time the Task Force considered the Castle Doctrine Act, Wal-Mart served as corporate co-chair. Why grant corporations such large influence? As ALEC has implicitly acknowledged, they are the entities that stand to gain from much ALEC-introduced legislation. When Terry Gross of National Public Radio asked ALEC's National Chair, Louisiana Rep. Noble Ellington, "Why give corporations such a big say in drafting legislation?" Ellington replied, "Well, partly because they're one of the ones who will be affected by it." ALEC’s work on advancing “stand your ground” laws, CMD also found, aligns with a contentious history of spreading bills that, however inadvertently, disproportionately impact communities of color. Of particular note is the ALEC model “Voter ID Act” requiring voters to provide only certain kinds of photo IDs at the polls. The Act could potentially disenfranchise millions of people who don’t have the required photo ID, but have proof of identity and residency – primarily people of color, the poor, and the elderly. Likewise, opponents of the “Castle Doctrine Act” say the self-defense provisions may encourage violence from a person whose fears are motivated by prejudice and racial bias. In response to ALEC’s uncovered role in conceiving legislation behind closed doors and provoked by the perceived injustice of Trayvon Martin’s murder, Color of Change has launched a campaign encouraging corporations that rely on business from African-Americans to stop funding ALEC through corporate membership dues. Matt Bellassai is a spring 2012 In These Times editorial intern.